Julie’s version of her ride as stoker in this stage is found on Nancy Yu’s blog. Julie and Steve rode the hardest set of stages. 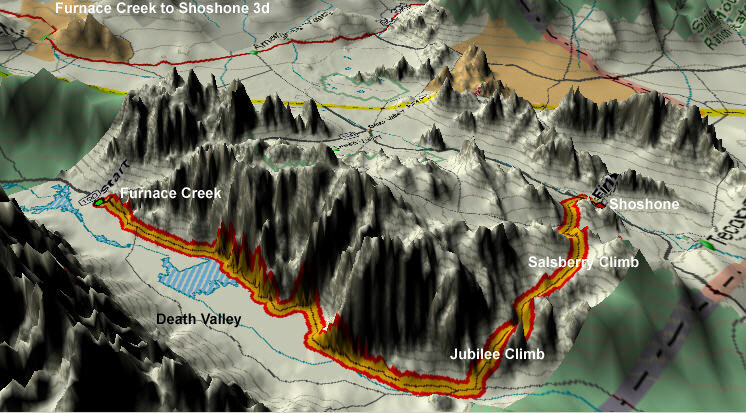 On paper, Nancy and Tim’s stage 3 ride would seem to be the hardest, since it is the longest and has the most climbing. 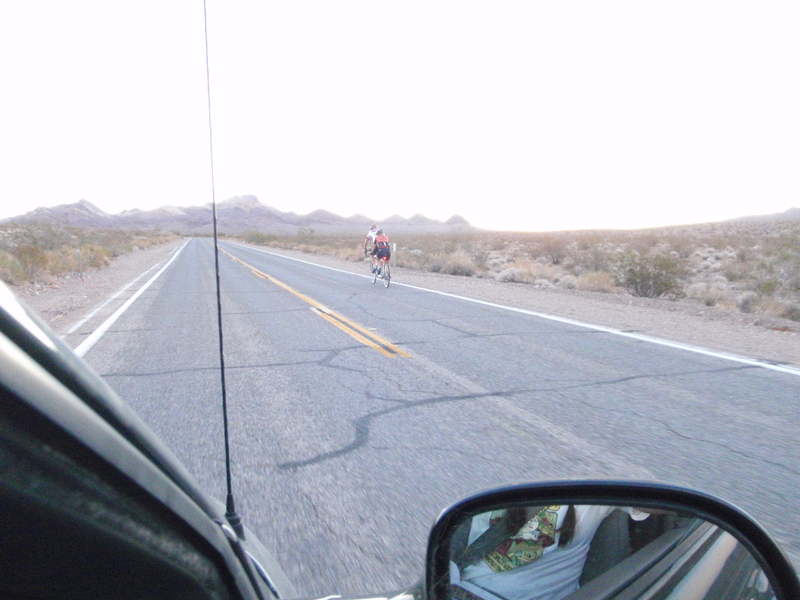 The hardest stage, however, is not the century that contains the 2-hour climb and that ends in Furnace creek at 0125; the hardest stage is the 73 mile leg that contains the three hour climb and that starts at 0125 and ends at 0733. Humans are not made to drive or ride between 3 am and 6 am. They are the witching hours. We did pass a few riders who stopped to sleep in their support vehicles. 508 miles is a long time to go without sleep and a number of the solo riders do bed down along this stage during the witching hours. Their stage started out very strong as they rode along the valley floor into a slight headwind, picking off half-bikes. They would see a bike ahead of them and, I swear, double their speed, sprinting past their competition and almost dropping the van. Julie said that Steve was like a dog, always wanting to be out front. At Jubilee Pass and Salisbury Pass our joy was terminated. We spent three hours slowly driving behind the tandem and trying not to fall asleep. Jason drank 3 of those Starbucks coffee caffeine bombs as he slowly drove the van in complete darkness following the climbing tandem, but finally succumbed and had to pull over. Tim took over the driving and I continued as shot-gun. Tim had gotten a small amount of sleep in the back while Jason drove, but he hadn’t really slept much. I thought that someone should be awake other than the driver and tried valiantly to stay awke, but completely failed. I could not stop myself from nodding off over and over again. I drank a coke and felt quite buzzed from the coke, but the buzziness did not prevent me from nodding off. Jason, sensing that the whole car was being overwhelmed by a fog of drowsiness, also tried not to sleep in the back seat. Tim did a good job. He stayed pretty far back from the tandem, so that if he did fall asleep or zone out, he would not actually hit our riders. He never nodded or even really appeared to be sleepy and his driving was steady, but he did seem a little zoned out. We were going 4 mph, so we would not get very far or get there very quickly if he actually fell asleep, but still, I was a little nervous. -but not nervous enough to actually prevent me from continuing to nod off. I spent 3 hours going 4-5 mph following a tandem in the dark feeling buzzed, tired, sleepy, and nervous all at once. I remarked to the four of us in the van that the only people actually awake were the two on the tandem. That supposition turned out to be an error. Julie spent much of that climb trying to keep Steve awake. Steve said he just wanted to get off the bike and sleep for a little bit. Julie talked to him, badgered him, and sang to him in order to keep him awake. Steve had not gotten much sleep on Friday night before the race and really did not need another sleepless night, especially one that involved climbing Jubilee and Salisbury passes by bike. His stomach was not giving him any pleasure either, so all in all Steve was a really good sport. I had been wrong, of the six of us, Julie, the stoker, was the only person awake that night and her handlebars do not actually control anything. Dawn broke and everyone woke up. Julie called us up to the tandem to yell at us that this hill needed to end already. Their descent was not much of a descent and they ended up pedaling into the next time station. Steve and Julie did a fabulous job riding a psychologically difficult stage into daybreak. Picture of Steve and Julie near the top of Salisbury after dawn. This picture is very over-exposed to be able to see them. Stage 4: Furance Creek to Shoshone. Stolen from the AdventureCORP site. Map made by Doug Dog Sloan. This entry was posted in Furnace Creek, Tandem and tagged 508, cycling, furnace creek 508, tandem. Bookmark the permalink.